On my way to cover the men’s 15km tradi­tional race in couple of hours. Finland has like less than 1% chance for a medal imho… Matti Heikkinen is the strongest candidate, but he has been sick for quite a while now, so perso­nally I don’t think he can make it. Sami Jauho­järvi is one of my favorite athletes. I guess simply because I have known him of for quite a while and we have been around together so much. But honestly, I don’t think he can make it either in this one. But Musti (as we call him in Finnish) has one true advantage over the majority of the athletes: He has this skill of looking good in images. Conscious or not, but he simply does it. 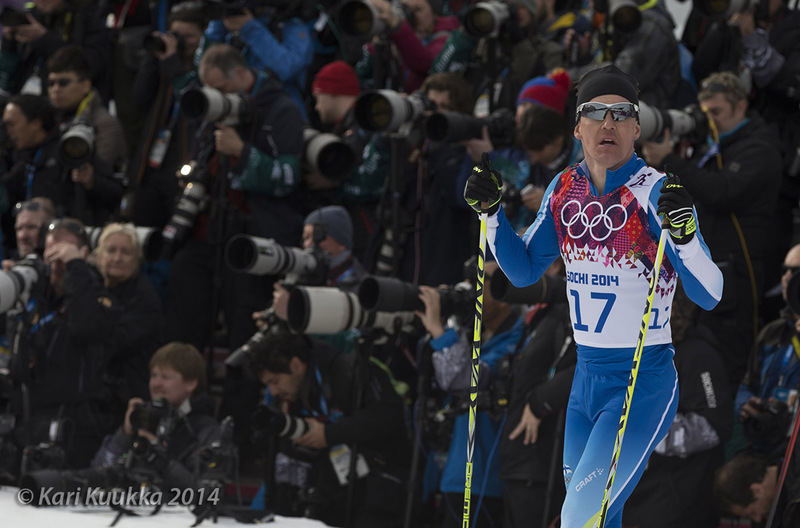 The image above is from the skiathlon (2x15km) race the other day. He was placed — man, don’t even remember, definitely not in the top ten — but for the first kilometer or so he stayed in front just so he would look good in pictures. And when he (eventually) does come to the finish, he places himself so that the backdrop was something unusual (photo­graphers) so again he makes a nice, different image. “Much obliged”, says the photo­grapher. 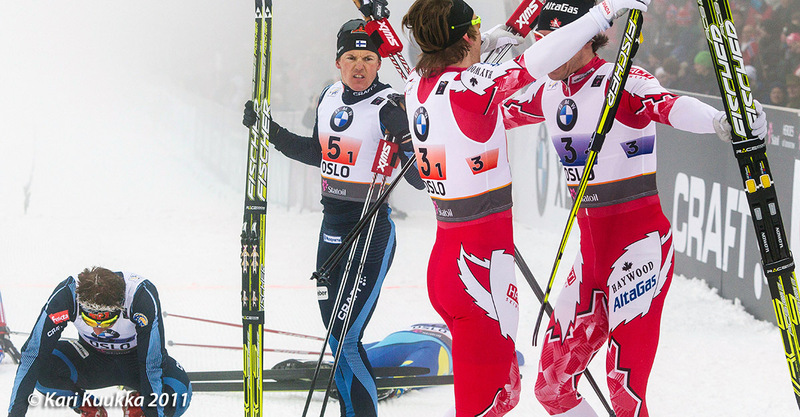 But my favorite of him is from Oslo WC two years back. Dual sprint, 6 laps and Finland was leading 5.5 laps… and placed fourth. I don’t think one needs words to explain what is going on through his head while he is watching the celebrating winning team. So as I stated in the headline: if you can’t win the race, at least make sure you look good in the pictures. :-) Jep. I would have liked to been sooooo wrong. But I was 0.2 secs. right… unfor­tu­nately. Seriously: I try to see the behavior of the journa­lists here — to understand if there is a buzz somewhere I should be aware of. Nobody raved about Iivo beforehand. Yes, I did notice his deter­mi­nation in training, but it was not enough that I would have even consi­dered him seriously. But then again, I am not a sports journalist — which is pretty obvious. If you noticed, this blog is really not about sports but photo­graphy and all things related. I leave the deeper unders­tanding of athletic achie­ve­ments to those you understand and know better.